The BEST pulled pork! 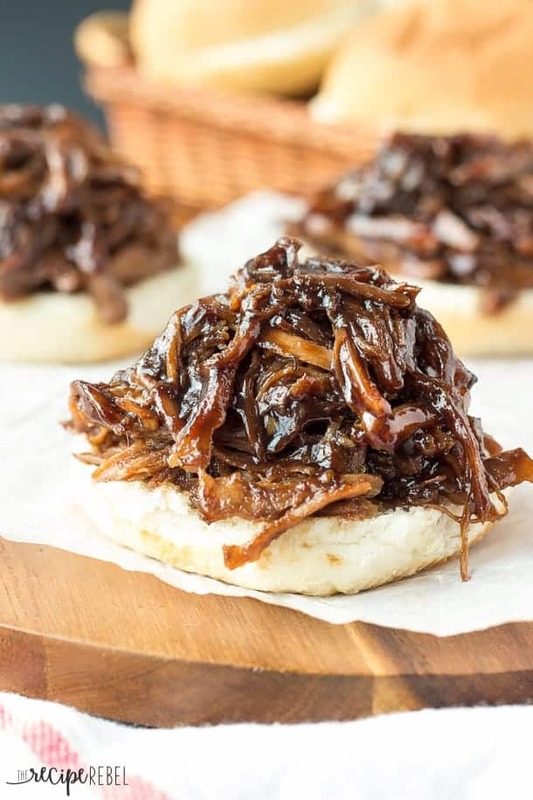 Slow Cooker Honey Balsamic Pulled Pork with an incredible thick, sweet and tangy honey balsamic sauce! Easy crockpot dinner. Includes step by step recipe video. So I like to think I’ve come a little ways since my days of quickly snapping a picture of my supper for the blog before diving in. But I have to admit, the though of photographing a big hunk of brown meat makes me a little nervous. It didn’t help that I laid down on the couch when the girls went for a nap and opened my eyes at 5:00. Luckily, I didn’t have much work to do on this incredible pulled pork. It’s always a little interesting trying to get some photos of something we’re eating for supper before it’s totally cold and unappetizing, especially as I’m rushing and trying to make it look like I didn’t just sleep until 5:00pm when the hubs gets home from work. Things get a little crowded in our dining room as we’re both maneuvering around the toys on the floor, trying to get a good shot of our supper in between periods of dark cloudiness and too-bright sunshine. Am I the only one out there who can’t stand the smell of balsamic vinegar? That is some powerful stuff. It makes my head hurt a little bit. The truth? It’s incredible. INCREDIBLE. 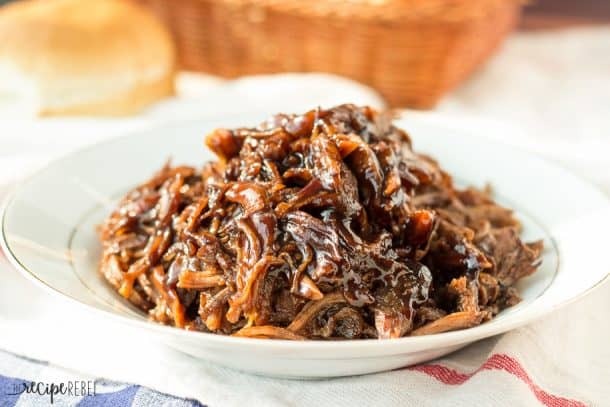 This is my favourite pulled pork recipe out there. 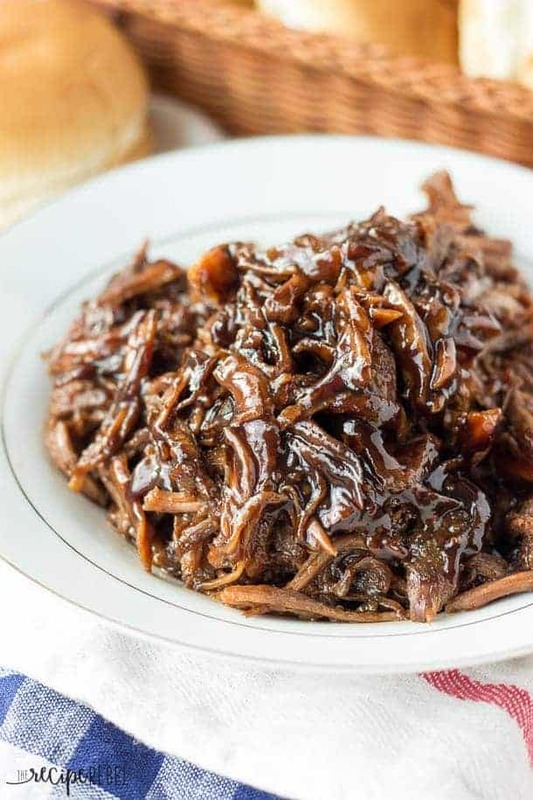 It is so easy just to throw a roast in the slow cooker in the morning, and then when suppertime rolls around the only thing you have to do is make the sauce. I mean, you could make a side to serve with it, but we don’t. When this pulled pork is on the table, I don’t need anything else getting in my way. Just some fresh buns and allllll that dark, drippy sauce! Try it. Maybe it’ll be your favourite pulled pork, too! Looking for more slow cooker pork recipes? Try this Slow Cooker Pork Tenderloin! 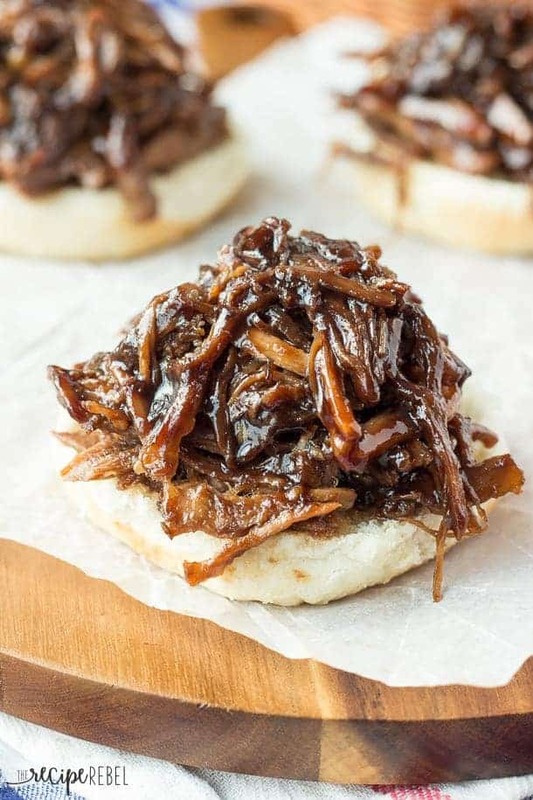 Honey Balsamic Pulled Pork is a new take on pulled pork that is sweet and sour! This dark, thick syrup-like sauce is incredible -- a must-try! Add the roast to a slow cooker. Top with water, seasoned salt and garlic powder. Cook on low for 8-10 hours or until falling apart. Just before your roast is ready, add the rest of the ingredients (vinegar through garlic) to a medium saucepan and bring to a boil over medium heat. Boil over medium heat for about 15-20 minutes, until thick and syrupy. Drain juices from pork. Shred your pork and stir in half of the prepared sauce. Serve the rest of the sauce alongside the pork with buns. Low if cooking for full 8-10 hrs. High if cooking 4-5 hrs. My family loved, loved, loved this recipe! 5 ⭐️. If you doubled the weight of the pork roast in the crockpot, would cook time be the same? I know I would double the ingredients for sauce and ingredients put in with the roast to cook. Just not sure if I need to adjust time of cooking the roasts. Made this for Brielle’s first birthday party yesterday and it was a huge hit! I’ve already sent the recipe to a couple people who asked for it! I made an 18lb pork shoulder in two crockpots and had one whole crockpot left over and A LOT of sauce leftover too, but we’ll find other ways to use it for sure! We already used it in a stir fry today and it turned out great! Oh that is awesome! I’m so glad you guys liked it! It should freeze really well, too, if you don’t want to eat it all now! Hi there. I am making this tomorrow and I was wondering about the honey. Does it matter if it is raw honey or clover honey? Thanks so much. I can’t wait to try this I LOVE balsamic vinegar. I can’t say I’ve ever had clover honey so I can’t say for sure, but I think it would work fine! This was absolutley delicious! My sauce didn’t seem to get very thick but WOW what flavor. This recipe is a definite keeper!! Thank you for sharing. Thanks Tisha! I’m so happy to hear that! I got an instant pot for Xmas and am thinking of converting this recipe for a dinner guest tomorrow night. Anybody want to help me estimate the timing? I love how tender meats turn out! And I’ve used my slow cooker for over 30 years, so no offense intended. 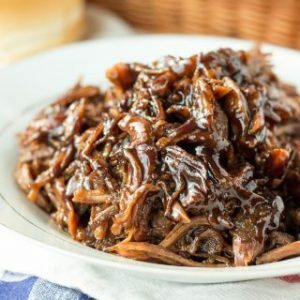 I love pulled pork out of the Instant Pot! I would probably cook for somewhere between 55 and 90 minutes, depending how large your roast is and if you cut it into smaller pieces. What seasoned salt do you use? I’m also struggling to get hold of red pepper flakes, can I just leave them out? I use Lawry’s seasoning salt. Sometimes red pepper flakes are called red chilis or something of that sort — you can definitely leave them out and add in something else for a bit of heat if you want it! Is it ok to use a bone in pork shoulder?? Yes, definitely! It just might take a little longer to cook. I have no other vinegar than distilled white will this work? This looks great! Thanks for sharing. I’m making it now. This might be a dumb question, but what do you use the extra sauce for after you split it in half? Do you think I could just halve the sauce recipe and pour all of it on the pork? Definitely! It will just be extra saucy. I sometimes just serve the rest with the sandwiches for dipping, too! So I’m looking for a pulled pork recipe that I can use to serve 25-30 people and cook it in my roaster. I’m not sure how much meat to cook so I’m sure I have enough. Plus I am wondering if this recipe will be ok in my roaster instead of a slow cooker. Thank you! I honestly can’t say I’ve made pulled pork in a roaster — the slow cooker just gets it so tender! If it was me I would probably cook a few roasts in the slow cooker, then transfer to a roaster with the sauce and reheat on a low temperature. I think a good average is 1/4-1/3 lb of meat per person, depending on what else you’re serving. Thanks for sharing! It may be a tad too sweet for my taste but I may try brushing it on some chicken wings I’m also grilling tonight. Thanks! I think it would go really well! I’m not much of a cole slaw person myself so I don’t have my own recipe, sorry! I hope you enjoy it! Oh my goodness. I just made this and followed the recipe almost exactly, EXCEPT I used pork tenderloin rather than pork roast, cooked it in an electric pressure cooker rather than a slow cooker, and added 1 cup of chicken broth instead of 1 1/2 cup water. I actually sprinkled the garlic powder and seasoned salt over the pork tenderloin and laid it in the pressure cooker after I poured in the chicken broth in (so the seasoning would not get rinsed off). I then pressure cooked it for 50 minutes and let the pressure release slowly rather than a quick release. While the pressure was releasing naturally, I made the sauce exactly as directed. Then, I shredded the pork tenderloin with 2 forks and poured half the sauce over it and mixed it well and used the remainder for . IT IS DELICIOUS!!! IT IS DEFINITELY KEEPER! SIMPLY DELISH! Thank you so much for sharing this recipe, Ashley! I am so happy to hear that! I’ve only had my pressure cooker a few months so I haven’t made this in there yet, but I’m definitely going to try now! I can’t stand balsamic vinegar so almost didn’t try this. Wow! It is so good! I couldn’t decide what to do with a pork roast I made in the crock pot a few days ago. I am not a fan of barbecue sauce and didn’t care for the pork plain. This was soooooo good. I saved to my Pinterest “tried and liked it”. It is definitely a keeper. Hi, this looks so amazing. How can you make it without a slow cooker? Thanks Ilse! I’m not sure that I would. The slow cooker makes the pork so, so tender. Do you have a pressure cooker of any kind? That would also make some pretty tender pork. Chicken would also be good with the sauce and a little easier to make without a slow cooker. I have made this several times and I thought I left a comment but I guess not. I am terrible at remembering recipes so I always have to come back here. Anyway, I wanted to add that this pulled pork is KILLA as a pizza topping! I always have sauce remaining so I ladle a little bit of that onto the dough in place of sauce. Add whatever else you think may be good; we add a mild cheese, caramelized onions and it’s amazing. Please do not ever delete this recipe from the internets, as I would probably cry. LOL Just kidding, I am going to print it out this time! Lol! I’m so glad you like it! I can’t believe I’ve never put it on a pizza — that sounds amazing! THanks Heather! It is my favorite pulled pork recipe! Do you have the nutritional information for this recipe by chance ? thank You very much for Your advice! I think I will start with a 6 qt. this recipe sounds delicious! Would You tell me how large Your crockpot is? Because I am about to buy one. I need one for a large family (maybe 8 liters) and I am wondering if I can use it for smaller amounts for, let´s say, 2 people, too, with a smaller amount of ingredients. Hi Julia! I actually have a 2.5qt, a 4qt and a 6qt. For this recipe I always use my 6qt and it’s a great size! I think the 6qt would be big enough to feed most large families, but I really love having a variety of sizes for options. I would maybe start with a 6qt (or 8, depending on how many servings you want to make at once!) and then add another to your collection if you need. Hi! I’m just wondering if it would be okay to leave it in the crock pot for closer to 11 hours instead of 10. I leave for work at around 7:15am and don’t get home until around 6:10/6:15pm. Hi Rachel — sorry I just saw this! You can absolutely leave it longer. There are a few ways to help adjust cooking time. If your slow cooker is generally cooler (meaning, you usually find you have to add time to most slow cooker recipes), then the extra hour won’t matter. If your slow cooker is hotter (meaning you usually find recipes are done sooner than the recipe calls for), you can add the roast frozen to the slow cooker and it won’t dry out if it’s left for longer. I’ve done this lots when I worked away from home and it worked so perfectly! If you have a cooler slow cooker I wouldn’t recommend a frozen roast though. It all just depends! I hope that helps! This was SO, SO, SO good. Oh my gosh. I’ll make this often. Thank you so much for sharing such an easy and delicious recipe. Thanks Maggie! It is by far our favorite way to do pork! Can you cook it on high to do it a little faster? If so, how many hours? 6? You could but I never really recommend that with a big chunk of meat like a roast. I would break it down into smaller pieces and try cooking on high for half as much time. I made this yesterday and it was absolutely delicious! My husband said it was restaurant worthy!!! This is now my favorite pulled pork recipe. Goodbye barbecue sauce!!! I am so happy to hear that! 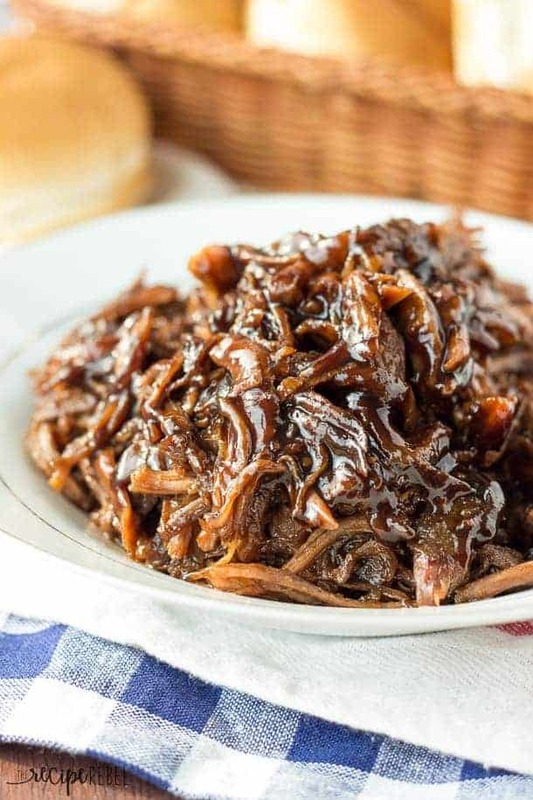 This is my FAVORITE pulled pork recipe! I’d like to sub maple syrup for honey. What digit think? Thanks!! I think it should work fine! It will definitely have a noticeable maple flavor as the honey is a main component, but I don’t think that’s a bad thing! in your directions section there is a mispelling. It says ” at the pork to the slow cooker” should at be Add? Thanks for letting me know! I’m not sure how I missed that! Can I just make the sauce and a pour over the pork to cook in all day instead of making at the end? And maybe eliminate the water so the sauce is not diluted? I want to make this while I am working….and don’t really want that extra step at the end. Thank you! Looks wonderful….making today! Hi Lori! You can definitely do that! The flavor of the sauce might be a little more muted (a little more “porky”), but I’m sure it will work. If you’d like to prep the sauce ahead you can always make the sauce and keep it in the fridge to toss the meat with later? Both ways would work! Phenomenal ‼️ How stand is a dietician so I was a little worried about all the sugar. I changed nothing went exactly by the recipe and it was delicious. Thank you! Hi Lisa! So happy to hear you liked it! You could probably substitute for a natural sugar if you prefer. About to serve this to the fam. Smells so good! I’m sure everyone will love it. I’m writing this instead of making a side salad. I love how much sauce this makes. PS. In the recipe you’re missing the timing (step 2) for when to start the sauce but it’s easy to figure out. Hi Tanja! Thanks for letting me know! I will try to add it in there. I’d love to hear how the family enjoyed it! I am a HUGE fan of pulled pork but it never occurred to me to actually try making it myself…until now! WOW this came out phenomenal! Thanks Daniela! This is by far my favorite way to make it! I wonder how it would taste using chicken. Has anyone tried using chicken? Ah the art of multi-tasking! 😉 Well it certainly paid off because those photos are incredible. Only you could make a hunk of brown meat look so incredibly appetizing! I’ve bookmarked this to try! i made this last night and we loved it so much that I will be making it again this weekend to take to a July 4th party. Do you know about how many people it will serve? Anytime! Love my slow cooker! Mmmm, I have been looking for a good pulled pork recipe. I’ve tried so many and I’m usually a little disappointed, but this one looks great! Can’t wait to try it! I love the smell of balsamic – but, it’s wonderful how unappealing flavors and smells can mix and become something so desirable! These photos rock! And I don’t even eat a ton of pork – but I wanna dig right in! Hi Ashley! This looks amazing! I love balsamic reductions and my friend in AR just sent me a really nice quart of honey, so I’m in! I think if I were to add a side it would be creamy coleslaw – just the South in me! That would go so well Dorothy! Was wondering if you have to remove the juice from the meat before putting in half the sauce??? Sorry — yes, I would definitely drain the meat juices before adding the sauce so it’s not diluted! Can’t believe someone else doesn’t like the smell. My husband said that it was in my head. I have, however, gotten past it long enough to try it in a peach cobbler recipe several years ago. It does something divine to food that I had to admit. This looks fantastic! I love pulled pork, and this sounds like it has amazing flavor! Well to be honest, I actually am totally in love with balsamic vinegar. I know I’m a little weird, but that smell is one of my faves lol. So I am ALL ABOUT THIS PULLED PORK. Pinning this ASAP. I love the simplicity of slow cooker meals! It just makes life sooo much easier! And I am totally with you on the balsamic vinegar! I love it with some fresh tomato and mozzarella but if I am going to make a balsamic reduction I usually pull the hot plate out of the pantry and plug it up outside so the whole house doesn’t smell like vinegar!